The Advanced Process Multi-Scanner offers unique time-saving and automation solutions to calibrate multiple pressure or temperature sensors simultaneously. 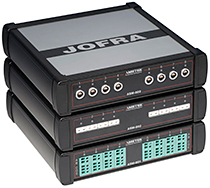 Each ASM contains an eight channel scanner controlled by Jofracal software on a PC. It can handle signals from 2-, 3-, and 4- wire RTDs, TCs, transmitters, thermistors, and temperature and voltage switches. Up to 3 ASM units can be stacked to calibrate up to 24 sensors at the same time. The ASM may be combined with any JofraCal compatible pressure calibrator, dry-block or liquid calibrators, DTI reference thermometers, and ASC multi-function process calibrators. Use any place where temperature measurement is critical and there is a need to create traceable documents for sensor calibration. JofraLog (Free) - Log data from multiple sensor devices at once. Depending on the number of ASMs connected, you can configure up to 24 input channels with various input devices and outputs at once.